Happy Holidays! Big thank you to everyone who has joined me on my journey into book blogging so far. Today I wanted to do a fun Christmas tag, since I celebrate Christmas, though I would love to incorporate some fun Yule traditions into my life. Hope you enjoy all the Elf gifs! The tag was created by Richard @ The Humpo Show, and I found this tag at The Calico Books. “ALL I WANT FOR CHRISTMAS IS YOU…” – WHAT BOOK DO YOU WANT TO SEE UNDER THE CHRISTMAS TREE? I have been fortunate enough to get a good amount of Amazon money this past week so I could pick up most any book I wanted this Christmas, but I would really flip for a Hardcover UK Gollancz edition of The Way of Kings by Brandon Sanderson. It’s pretty impossible to find nowadays! “SIMPLY HAVING A WONDERFUL CHRISTMAS TIME” – WHAT BOOK THAT YOU’VE READ THIS YEAR DID YOU ENJOY THE MOST? I feel like I talk about it every single day, but I was just so so impressed by Give the Dark my Love. Beth Revis did an amazing job crafting this dark and twisted origin story and I can’t wait to read it again, and of course to see where Nedra’s abilities take her in book 2. ELF – WHAT BOOK UNLEASHES YOUR INNER CHILD? I feel like any book that makes me really truly excited, to the point where I’m exclaiming aloud, or gesticulating wildly unleashes my inner child. It’s so wonderful to find stories that can spur on that kind of emotional response. Some of the books that did that for me this year include Wicked Saints (comes out in April! ), & Two Dark Reigns. I had a great time getting totally wrapped up in both of those books. “IT’S BEGINNING TO LOOK A LOT LIKE CHRISTMAS” – WHAT BOOK HAS THE MOST FESTIVE LOOK TO IT? 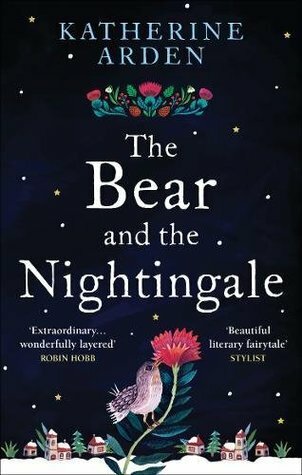 I recently read The Bear and the Nightingale by Katherine Arden and I love the UK covers. I had to get the UK Paperback for myself, it’s just so pretty! THE GRINCH – YOUR FAVORITE VILLAIN. Ooo I can only pick one? There are some truly evil creatures in Priory of the Orange Tree that I found fascinating, but I don’t think it can get any worst than Odium from The Stormlight Archives. THE HOLIDAY – NAME YOUR TWO FAVOURITE COUPLES. Ew barf. Relationships aren’t my thing, so I really had to struggle to come up with TWO!? Kvothe & Denna. I mean neither of them is perfect, and that’s what makes them so perfect together. I just want them to travel the world in their own caravan making up songs for some musical magical children. For the 2nd one, I’ll go with Nina Zenik and whoever she winds up with during King of Scars. Pretty sure I am going to live and die for her new lady friend. I wish I could afford to give everyone a copy of Priory of the Orange Tree when it hits shelves! I can’t do that, but I am going to be giving away a few preorders next month. Make sure you’re following my Bookstagram page to learn how to enter! That’s all for this tag! I tag anyone who feels lots of Holiday spirit this year…or anyone who might need some extra! Have a safe and happy end to 2018! This was so much fun to read!! I love how you found an Elf gif that perfectly captured each question. 😂🎄I really need to read The Bear and the Nightingale! I’ve heard so many amazing things about it! !